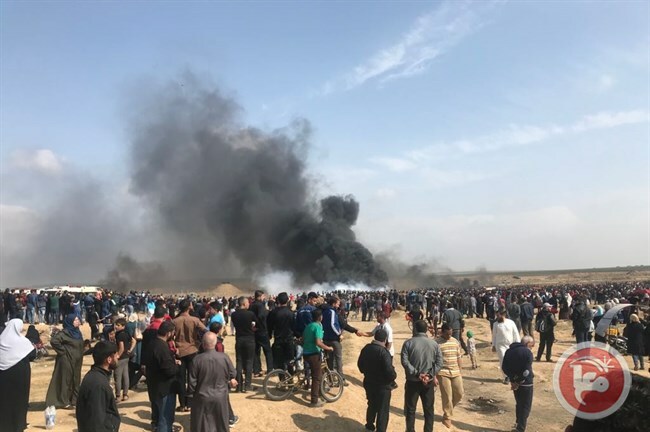 GAZA CITY (Ma’an) — Israeli army forces killed three Palestinian protesters on Friday, and left more than six-hundred injured in another deadly day of the “Great March of the Return” demonstrations on the Gaza border. Of the 611 injured, 154 were struck by live ammunition from Israeli forces, according to Gaza’s health ministry. The demonstrations, entering their fifth-week, have left a total of 45 Palestinians dead, with a reported 5,500 injured. There have been no reports of Israeli fatalities. Israel’s response to the demonstrators has come under fierce criticism from the UN Commissioner for Human Rights, Zeid Ra’ad al-Hussein, who called for into question the Israeli army’s use of “excessive force”, adding that Israel should be held to account.